Below is a former proposal for a petition calling for the placing of a large ‘Senedd Cymru’ / ‘Parliament of Wales’ sign and large Welsh flag on the main front public entrance of the Senedd building in our capital city Cardiff. Unfortunately, this petition as it was could not be accepted as, set out in the Government of Wales Act 2006, the official name has to be Cynulliad Cenedlaethol Cymru / National Assembly of Wales or simply Senedd. But not Senedd Cymru. 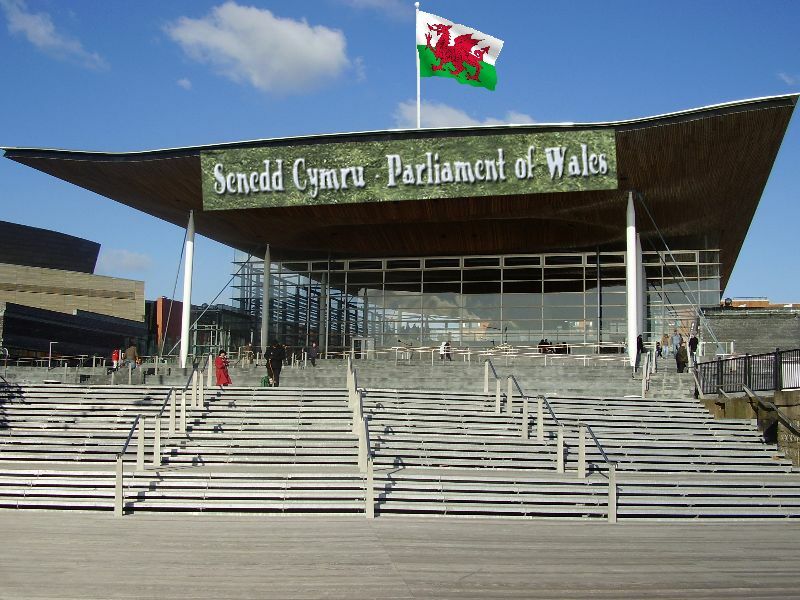 “We call on the National Assembly for Wales to urge the Welsh Government to insist on placing a large prominent and impressive sign on the main public entrance of the Senedd building overlooking Cardiff bay, with large prominent lettering denoting ‘Senedd Cymru’ / ‘Parliament of Wales’, together with a substantial and impressive Welsh flag placed centrally at the front tip of the sloping roofed entrance. However not all is lost. But at this point in time it seems that the only way it can be proposed that the name of our Welsh democratic institution is changed is via the government of another country – there is a rumour that AM’s have to put their hands up before going to the toilet as well. To change this name we apparently need to go the Westminster Welsh inspired petition scheme, where it’s possible to sign a petition by councillor Arfon Jones to change the name of ‘Cynulliad Cenedlaethol Cymru/ National assembly of Wales’ to ‘Senedd Cymru / Welsh Parliament’ (allthough personally I prefer Parliament of Wales but hey) It may need around 99,976 more votes before it’s officially considered but you never know. Alternatively if there are any good patriotic lawyers out there who would like to find an easier way to solve this by discussing it directly with our own Welsh Government then maybe that would be a bit easier. As regards to sticking a lovely large and international tourist enticing Welsh flag on the front of the main entrance of the Senedd building itself, maybe the designers of the Assembly building still need to be dissuaded from thinking that a large centrally placed Welsh flag and sign would somehow be a bit too…..Welsh? I for one hope that as well as starting to form a real parliament that shows real purpose, our paid representative servants will also see sense and push to add a bit of colour and pomp to the place soon.